Hail and well met, this second day of the year two thousand and eight. Word on the street is that it’ll be vastly superior to that old 2007 model: more processor speed, higher definition, and hey, did we mention it’s one whole number higher? That’s right, the future is now. I’ll be getting up close and personal with said future next week as I venture forth from my mountaintop lair in order to travel to the City of Sin for the 41st annual Consumer Electronics Show. And because of my dedication to you, readers, I will be sacrificing the many temptations Las Vegas has to offer (namely $3 brunch buffets, Wayne Newton, and fountains of pure gold) to bring you the latest on consumer electronics. Meanwhile, this week we’ve still got our habitual troika of gadgetry for your viewing pleasure. Take a gander at a new underwater camera, a handy (literally) measuring device, and a way to keep tabs on people…who probably don’t want you keeping tabs on them. Like shooting fish in a barrel. With a camera. Underwater. It’s not often that I need to take pictures underwater, but it pays to be prepared for all potential eventualities—that’s why I continue to carry my trusty bat shark repellent with me at all times. 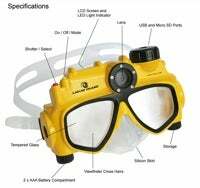 Were a need for submerged photography to arise, Liquid Image’s Digital Camera Mask would unquestionably depth charge the competition. I mean, come on: it’s built into a diving mask; how awesome is that? Now you can see underwater and take pictures. That’s two things I wasn’t able to do before. Available in 3.1 or 5.0 megapixel models, the mask takes SD memory cards (it comes with a 16MB card that you’ll fill up pretty quickly) and can even shoot VGA video at 18-25 frames per second. It’s waterproof at depths up to 15 feet, making it ideal for your next snorkeling expedition (I hear you’re quite the snorkeler). And the whole shebang takes just two AAA batteries and has a standard USB port, so it’s compatible with both Windows and Mac users who like to spend time beneath the deep blue sea. Plus, have we mentioned its truly slicktastic styling? I mean, it’s so useful having your camera mounted on your head—so convenient, in fact, that I’m considering wearing this thing all the time, just so potential photo ops don’t escape me. See a celebrity on your lunch hour? Click. Something funny happens at the office? Click. Monkeys start rollerblading down the street? Fire up that video. See? This won’t annoy your friends and loved ones in the slightest. A friend of mine recently bragged that he could easily demonstrate how long eight inches was—because he had gotten into painting miniature figurines. 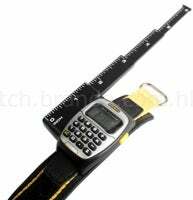 Not all of us are endowed with such measuring prowess, but for those who aren’t, there’s the Stanley Calculator Ruler Watch. Now, I know what you’re wondering: what exactly does the Stanley Calculator Ruler Watch do? I realize the naming is somewhat opaque, so let me elaborate: it measures, tells time, and lets you make simple calculations, all without leaving the comfort of your own wrist. Plus, act now and they’ll throw in this hideous industrial design absolutely free. This $62 travesty watch features an eight-digit calculator (with error signs and decimal point! ), quartz-based crystal time, and a six-inch ruler, plus an automatic calendar (which, we are assured, handles months with anywhere between 28 and 31 days) and a 24 hour alarm. While it may not fulfill your 8” measuring needs, you can rest secure in the knowledge that you’ll be the envy of everyone else on your block. As long as your block is entirely populated with clones of Norm Abram. This is not the first time I’ve lauded a remote-controlled vehicle combined with some other useful device, and I tell you now, verily, that it shall likely not be the last either. That is my simple, one-plank presidential campaign platform: more things need to be remote-controlled and on wheels. Like my refrigerator. Or cat. Or eavesdropping devices. 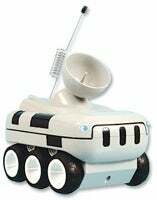 The catalog also claims that it’s capable of entering a room undetected, which I find slightly suspect, given that in my experience most remote-controlled cars make instantly recognizable high-pitched whining sounds akin to the feeding cries of the creatures from Alien. Then again, if you actually want to start spying on people via a remote-controlled car, it seems like you may not be the kind of person who thinks things through in the first place. Well, I hope you’ve rung in 2008 in style and bid good riddance to that junky 2007. As I mentioned, I’ll be at CES next week, so as long as I don’t get stuck in one of those clock-less casinos, I’ll be posting from the show floor. See you then.